Should we start a countdown to the last day of summer? While the weather is still hot and sunny for many of us, we are thinking about all the fun activities our little ones can experience before it goes away! Here are some easy and fun summertime ideas and activities from around the web (for indoors and outdoors) to do with your kids. 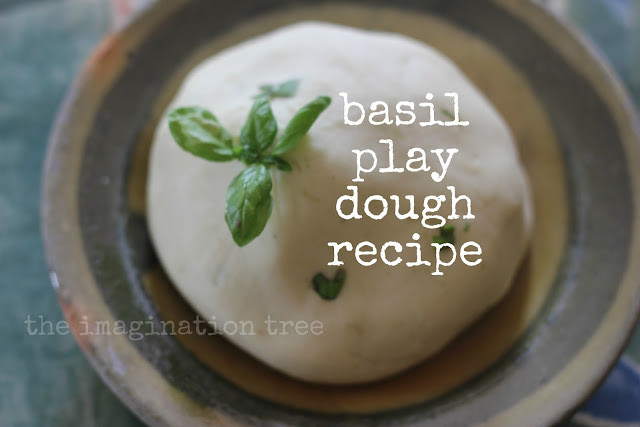 Make this natural, herbal play dough with your toddler! It smells so fresh and yummy - just like a pizza pie! There is so much your tot can do with play dough. From making patterns and discovering different textures using natural items found from a walk in your neighborhood or in the park to just rolling and kneading...and mushing! Take a look at Danya Banya's Nature Stampers for some more ideas like the one below! Sensory bins equate to HOURS of fun and exploration for your kiddos, and are so satisfying to put together. Use a plastic bin that you already have, and follow these directions to create an amazing summer-themed activity that inspires the imagination! What can you do on a hot day when you just need to get the child out of the house? Grab your bathing suits, throw on your sandals, get the necessary materials, and head outside! Your little artist can make the most gorgeous and inspirational paintings...right outside your front door. Check out Growing a Jeweled Rose's post to learn more! And...if all else fails, have some quality time throwing water balloons at one another! Nothing says summer like watching birds fly in and out of their homes. Toddlers love to observe birds, and what better way to do so than to make their own bird house. Here is a great list of 14 DIY bird feeders especially for kids! The ones in the image above are made with picture frames! Take a walk around your neighborhood, go on a hike or a nature walk with your toddler and go on a scavenger hunt. This is a great way for your child to learn about nature while having a grand old time in the process! Hands on as We Grow has a terrific post with a printable scavenger hunt for you to do today! How We Learn has brilliant and super creative ways to combine nature with art. Your kids will absolutely love it, and we recommend that all adults try these activities as well! We truly hope you have a blast with your kids this summer...whether you are outdoors on a gorgeous day or indoors on a cozy, rainy one...cherish every beautiful moment together.